2017 has been a skier’s dream! It has been snowing on and off for the better part of the New Year in Utah which is amazing for tourism and recreation but for the seasonally affected, you may be looking for reminders of blue skies and warm temps. 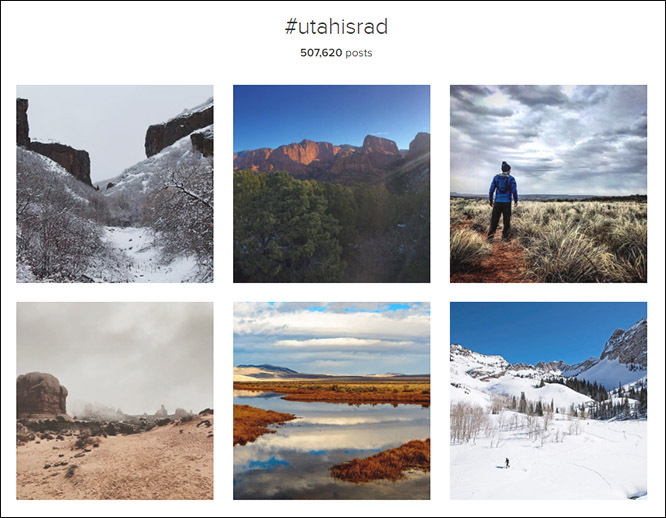 Look no further than Instagram and type in #UtahIsRad. Here you will find all the ways real locals celebrate the breathtaking beauty of Utah and all the things that make this state so special. The hashtag gives you an idea of just how vast and diverse the landscape and entertainment is here. Plus, you can revisit some of the most gorgeous summer weather scenes to warm your soul. When scrolling through those photos I can’t help but marvel at the talent Utah residents have for capturing and sharing Utah’s beauty. At the risk of sounding really old, I can’t believe most of these photos are taken with a cell phone! So film scouts, take a look! Utah has just about every scene you can imagine and the locals have done the legwork to get you tons of beautiful shots. Oh and if by chance an actual film scout is reading here is a Film Directory of Utah locations. Spots to relax? Of course!